Black Panther is officially taking over theaters across the nation, with the Marvel epic poised to pull over $200 million during its opening weekend. 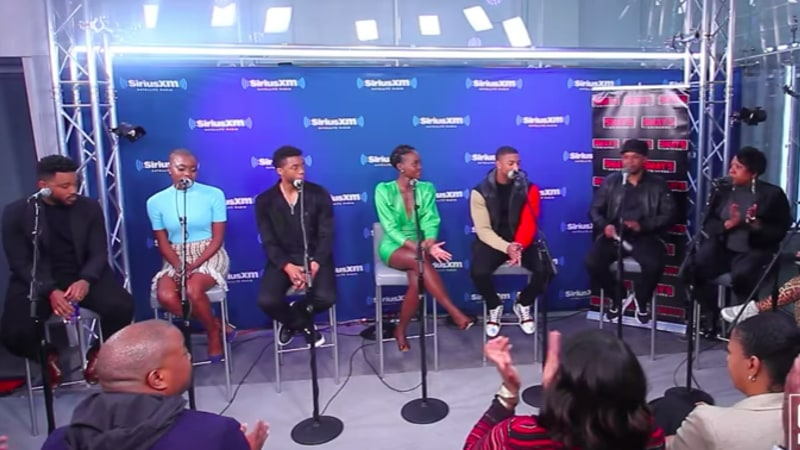 In celebration of Black Panther finally being released to the masses, director Ryan Coogler and the cast of the film, including Chadwick Boseman, Lupita Nyong'o, Michael B. Jordan and Danai Gurira, stopped by Sway In The Morning to discuss the making of the long-awaited film. During the sit-down, Coogler talks about wanting to honor the authenticity of the comic book itself, as well as how it was important that he and the film's creators drew inspiration from African cultures and history to help bring the fictional country Wakanda to life. "I wanted to obviously do service to the books you talked about reading and it wasn't lost on me that these were comics that have existed for over fifty years," Coogler begins. "You know, that's a lot longer than I've been around. I wanted to be respectful and really harness the great work that the artists have put into those books." He then segues into how he also pulled from Africa and the dynamic and vibrant cultures that make up the continent during the making of the film, explaining how he feels Marvel especially has a knack for bringing these superhero stories to life in a way that doesn't feel like they're solely a work of fiction. "I wanted to honor that but at the same time we wanted to pull Wakanda into the real world," he continues. "What I thought Marvel Studios did well with their films [is how] when Iron Man runs around L.A. and when aliens fall from the sky in Avengers in New York, it feels like the Los Angeles we know; it feels like the New York that we know. It feels more real and more urgent. I wanted Wakanda to feel like a tactile place. I wanted to pull from the continent of Africa and pull from different cultures there on the continent and pull from our history there on the continent to construct how the buildings look, the clothes that the characters would wear and more importantly how the characters treated each other." Elsewhere throughout the studio visit and in-depth interview, the cast speaks passionately with host Sway about the impact this film and accompanying movement is having on both the black community and all communities alike. Take a look at Ryan Coogler discussing the importance of authenticity in the clip above, as well as check out the full interview via Sway's Universe, below.